KCC Egis held off Goyang Orions to take the lead in the series. The hosts were ahead by 2 points but lost the second period ending it with a 2-point deficit before their 20-11 run, which allowed them to win the game. KCC Egis dominated down low during the game scoring 64 of its points in the paint compared to Goyang Orions' 38. They outrebounded Goyang Orions 44-30 including 29 on the defensive glass. Worth to mention a great performance of American Brandon Brown (201-85, college: CS San Bernar.) who helped to win the game recording a double-double by scoring 33 points (!!!) and 17 rebounds. The former international forward Jung-Hyun Lee (191-87) contributed with 26 points and 5 rebounds for the winners. Brown is a former Eurobasket Summer League player, which is considered top international summer league in the market. 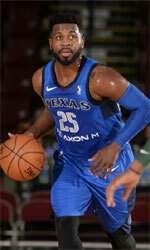 American power forward Darryl Monroe (201-86, college: George Mason) answered with a double-double by scoring 24 points, 10 rebounds and 4 assists and the former international forward Il-Young Heo (197-85) added 23 points and 8 rebounds in the effort for Goyang Orions. Four Goyang Orions players scored in double figures. Goyang Orions' coach Il-Seung Choo rotated ten players in this game, but that didn't help. LG Sakers outgunned KT Sonicboom in the opener. LG Sakers looked well-organized offensively handing out 23 assists. Central African-American power forward James Mays (205-86, college: Clemson) fired a double-double by scoring 28 points, 16 rebounds and 5 assists for the winners. 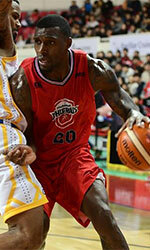 International center Jong-Kyu Kim (207-91) chipped in a double-double by scoring 24 points and 12 rebounds. The former international forward Hongseok Yang (199-97) produced a double-double by scoring 15 points and 13 rebounds and American forward Marcus Landry (201-85, college: Wisconsin) added 23 points and 6 rebounds respectively for lost side. Both teams had four players each who scored in double figures. Both coaches used bench players in such tough game.